Several options exist for clean fuel production in the long-term future. Next-gen biofuels have the potential to approach current oil prices at a low environmental cost. Hydrogen can be produced economically from excess wind/solar power, nuclear heat or fossil fuels with CCS. Transport and storage costs will limit the locations where hydrogen can be economically distributed. Ammonia and hydrocarbon synfuels from clean hydrogen can be competitive for long-range transport applications. The previous two articles described why the internal combustion engine (ICE) will remain highly competitive for decades to come and how it may adapt in the future. Another fuel-fed drivetrain, fuel cell vehicles (FCVs), was also discussed. Currently, almost all liquid fuels for ICEs and hydrogen for FCVs come from fossil fuels. Naturally, this situation cannot last forever, and sustainable alternatives will eventually be required. This article will review some of these alternatives. The first and most obvious candidate for sustainable fuel production is biofuels. Estimates of total technical potential of biofuels vary widely, but central estimates for the long-term future are generally in the order of 100 EJ/year – roughly the rate of transportation energy consumption today. In the image below, L, M & H represent low, medium and high scenarios in two cases where biofuel production from food crops is allowed or not. The dotted lines show the range of scenarios for fuel demand. The second candidate is synfuel from renewable electricity. Given the significant efficiency penalties of these processes, they will only be economical at very low electricity prices. Wind and solar start to create instances of such very low prices already at moderate market shares. In a renewable energy future, wind and solar might supply about 60% of electricity, after about about a third of the total generation potential is curtailed. If we assume a tripling of global electricity generation and 70% synfuel conversion efficiency, this excess wind and solar power can supply 56 EJ/year – about half of current transportation fuel demand. Future high temperature nuclear reactors could also produce hydrogen through thermochemical process routes. There are no relevant bounds to the rate at which these fuels can be supplied, but these reactors will need to overcome a number of technical, economic and political hurdles. Any marginal supply beyond these sustainable sources can be met by conventional fossil fuel pathways with CCS. We have enough resources and CO2 storage capacity for several centuries of such marginal supply. It is therefore clear that the world has sufficient potential for long-term transportation fuel production. In the next sections, we’ll take a look at the economic aspects. Fuels produced from cellulosic plant matter have a much smaller negative impact on the environment and food supply than first generation fuels like corn ethanol. The IEA thinks that these technologies have the potential to reach prices competitive with oil at $45-70/bbl. Synfuel production offers an attractive method for productive utilization of wind and solar output that would otherwise have been curtailed. Plants can be built close to the highest concentration of wind/solar sources causing negative prices, thus requiring minimal electricity transmission costs. Easily exportable synfuels also offer a good solution to the challenge posed by the highly uneven renewable energy potential and population density around the world. 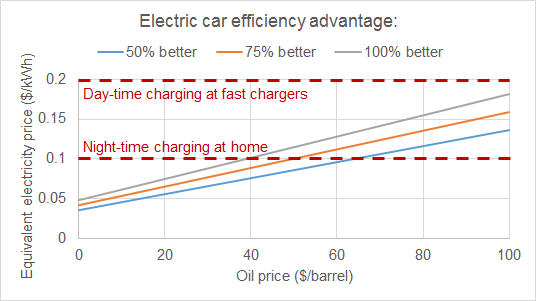 Naturally, it would be most efficient to charge battery electric vehicles (BEVs) with this low-cost electricity, but this will bring serious practical and economic problems. 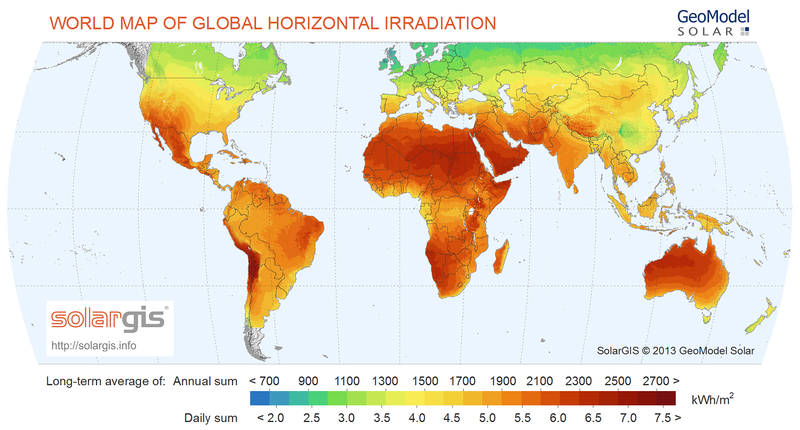 For solar-dominated systems, it will mean that the bulk of charging must happen in the few hours around noon. This will mean massive public charging infrastructure buildouts, expensive increases to distribution capacity, and substantial inconvenience for drivers. Prices in wind-dominated systems will fluctuate randomly and mostly over timescales that are longer than the daily cycle that is best suited to electric cars. A strategically located synfuel plant can avoid these challenges. One potential issue is the low capital utilization rate, but growth and interest rates are likely to be very low by the time that this technology becomes relevant, making this of lesser concern. The cost estimates presented below assume a 3% discount rate and 30% capacity factor. The following graph was created for hydrogen production from future PEM electrolysis. Hydrogen transport and storage costs are estimated from this old NREL report. Adjusted for inflation, short distance transport and storage of small quantities of hydrogen (e.g. to filling stations) would cost about $1/kg. Another $1/kg needs to be added for long-distance transport of large quantities of hydrogen (e.g. from a large plant to a distant population center). Long distance transport of small quantities of hydrogen (e.g. to an isolated filling station) costs $2/kg or more. An additional $0.5/kg was added for storage at the fueling station. Keep in mind that a kg of hydrogen has about the same energy as a gallon of gasoline where total refining, distribution and marketing costs are about $0.8/gal. In practice, this means that a population center located close to a large concentration of wind/solar generators could get totally clean hydrogen fuel for a price equivalent below $100/bbl of oil, if the average electricity cost during the 2600 lowest cost hours of the year amounts to less than $20/MWh. As shown in the graph below (for California), such a situation is a real possibility, especially in scenarios with high solar PV market share. A population center that is further away from the production site will pay about $1/kg ($45/bbl) more, and an isolated location another $1/kg on top of that. It is therefore clear that renewable hydrogen can be economical, but only under certain circumstances. Compared to ICE cars, the maximum efficiency of FCVs will be slightly higher, although still below a BEV. 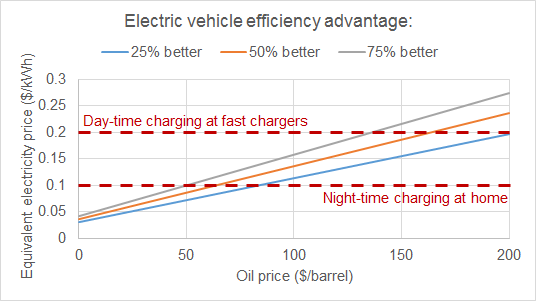 The chart below shows the breakeven electricity price for BEVs to match FCVs over three different levels of BEV efficiency advantage. One way to avoid the large transport and storage costs of hydrogen and to enable international trade is to transform it into a fuel that is a liquid at or near room temperature. Two main options will be reviewed here: liquid hydrocarbons (from Fischer-Tropsch) and Ammonia (from Haber-Bosch). Both processes should convert energy in hydrogen with an efficiency of about 80%. An additional hydrogen storage cost of $0.5/kg will be added to add a buffer between intermittent hydrogen supply from wind/solar and constant hydrogen consumption by the plant. Ammonia distribution costs are assumed to be double that of gasoline ($0.8/gal instead of $0.4/gal). 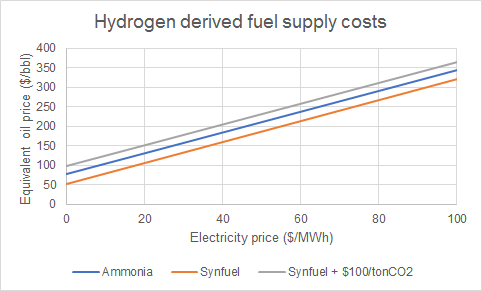 In this estimate, hydrocarbon synfuels are more economical than ammonia up to an effective CO2 price of about $60/ton. It should be noted that hydrocarbon synfuels will be produced using captured CO2, earning the plant a small credit because CO2 storage costs are avoided. However, it is likely that, even with this credit, longer-term CO2 prices make the ammonia option more economical. Ammonia can potentially be used in ICEs or fuel cells, although the fuel cell may be more costly and less efficient than a hydrogen fuel cell. The efficiency deficits of an ICE will therefore be used in the comparison. It is clear that, in terms of fuel costs, ammonia will only be able to compete in long-range applications where BEVs need to rely primarily on dedicated fast-charging stations. Finally, it should be mentioned that such a large-scale rollout of electrolysis plants will also produce a large quantity of high purity oxygen as a byproduct. This oxygen can be used for simple oxyfuel CO2 capture with no energy penalty. 50 EJ/year of hydrogen production via electrolysis can produce enough oxygen to facilitate the highly economic capture about 2.5 Gt/year of CO2. One smart way of using this potential would be to combust fossil fuels on site to supply heat so that a high temperature electrolysis process can be used, reducing electricity demand per unit hydrogen by about a third. This will increase the technical potential of this route by 50%. A number of different pathways exist to produce hydrogen from heat and electricity produced by nuclear power. According to calculations in a fairly recent paper, hydrogen production costs could reach $2.5/kg in a high temperature reactor. As shown below, the most cost effective configuration produced both thermal (T) and electrical (E) energy to feed the hybrid sulfur hydrogen cycle. 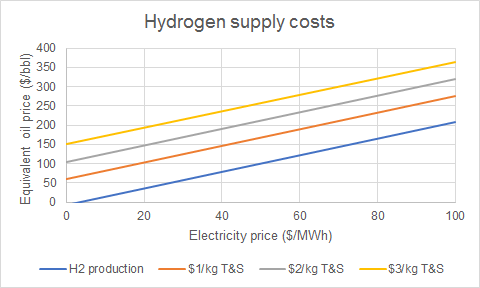 For comparison, a cost of $2.5/kg corresponds to PEM electrolysis costs from electricity at $40/MWh reviewed in the previous section ($30/MWh for synfuels since no storage buffer will be required for hydrogen from a steady-state nuclear plant). In this price range, synfuels from nuclear may be just on the edge of competitiveness with electric drive in terms of fuel costs for long-distance transport applications. Promising methane reforming processes with inherent CO2 capture are under development. For example, a recent study on membrane assisted chemical looping reforming indicated that this process could produce hydrogen with CO2 capture at a similar cost as current conventional steam methane reforming, although the capital cost portion of the cost distribution was higher. 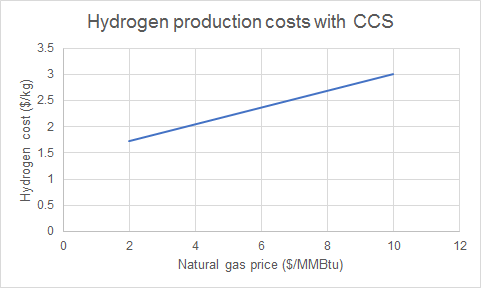 The graph below shows the hydrogen production cost as a function of natural gas price using the cost assumptions in this paper. Depending on natural gas price developments, this pathway can produce hydrogen at a similar or slightly lower price point than advanced nuclear discussed in the previous section. The process can also produce a pure stream of nitrogen, avoiding the air separation expense of ammonia production, bringing a moderate additional cost saving. Long-term biofuel developments are likely to keep ICE fuel costs competitive with electricity costs for fueling BEVs for most applications. In case biofuels substantially underperform expectations, ammonia or hydrocarbon synfuels produced from clean hydrogen will only be competitive on a fuel cost basis in long-range applications where a BEV would have to charge from dedicated fast charging infrastructure at higher electricity prices. 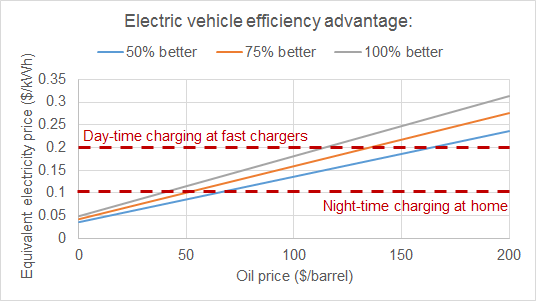 Naturally, a long-range vehicle with an ICE or fuel cell will always be significantly cheaper than a long-range BEV (there is no need for a large battery pack). Hydrogen produced from excess electricity during wind/solar peaks, thermal processes using nuclear heat, or fossil fuels with CCS will also remain competitive on a fuel cost basis for most transport applications. However, the transport and storage costs of hydrogen are significant, thereby limiting the locations to which hydrogen can be profitably distributed. Hydrogen can therefore not become a truly ubiquitous fuel source as oil is today. Overall, a sufficient number of alternatives exist for clean fuel production in the long-term future to ensure a diverse transport energy mix. Electricity for BEVs, hydrogen for FCVs and biofuels/synfuels for ICEs will all have their place in the market. A diverse range of energy sources will ensure a reliable supply and a high degree of competition to keep prices low, thus benefiting consumers and general economic efficiency.